Indian Beauty Zone: PR Info-Let Your Hair Sparkle Every Day with the New Sunsilk Radiant Shine!!! PR Info-Let Your Hair Sparkle Every Day with the New Sunsilk Radiant Shine!!! pollution may rob the hair of essential shine and moisture, and leave it dull and limp. 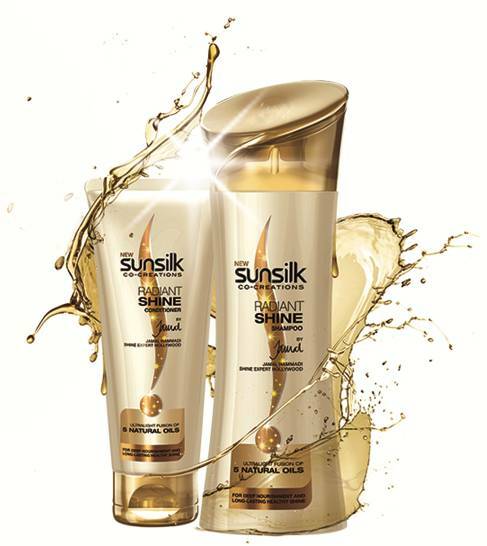 Comprehending this situation, Sunsilk put its expert team on the job and designed a perfect solution in the form of ‘Sunsilk Radiant Shine’, an innovative product, which gives long lasting hair shine. So get ready to flaunt your shiny tresses and stand out with confidence as the new Sunsilk Radiant Shine adds a radiant shimmer to your hair. Argon, Jojoba, Camellia, Almond and Olive. The dual effects of oiling and washing to a large degree soften the hair texture not just from the outside, but actually aim to ensure that the hair receives its share of nourishment at periodic intervals. The light oils permeate upto three layers deep and give hair a natural sheen that stays as the day progresses. Sunsilk Radiant Shine shampoo and conditioner work in combination to produce an enduring visibly glossy look that stays on and on! shiny hair often turns dull within time. family, as one of Co-Creators. Sunsilk Radiant Shine is definitely the new best friend that every young girl must have and get ready to flaunt that beautiful shiny mane all day long” So girls, shine your way with self-confidence and assurance of Sunsilk Radiant Shine! Very affordable... :). Hope it gives shiny hair as promissed.. The brand was sold on quite a low price in England but I've tried some products a very long time ago and they really worked on my hair. Its not really available in the U.K anymore unfortunately, apart from amazon and the prices are a lot more, xoxo. Thanks for the info hopefully it will live up to it's expectations.